Study identifies two proteins responsible for safeguarding skin stem cells epigenetically. Skin renews, heals wounds, and regenerates the hair that covers it thanks to a small group of stem cells. These cells continually produce new ones, which appear on the skin surface after a few days. 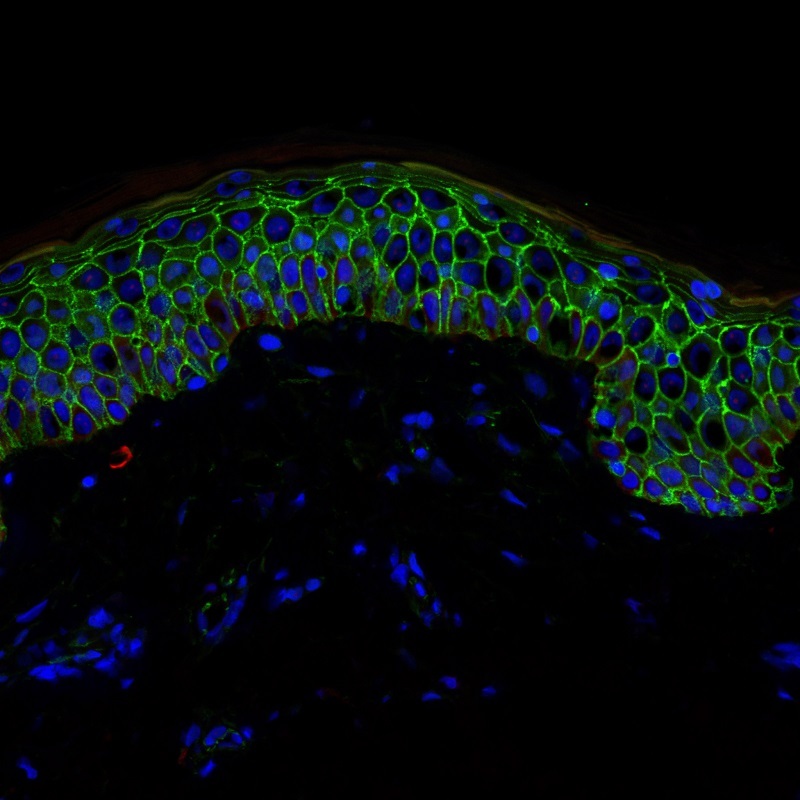 Now, a study led by IRB Barcelona identifies two proteins that are fundamental to conserve skin stem cells and shows that without these proteins skin stem cells are lost. The team state that the proteins identified, Dnmt3a and Dnmt3b, are crucial for the self-renewal of skin stem cells, and without them stem cells collapse and disappear from the tissue. The opensource study is published in the journal Cell Stem Cell. Previous studies show that Dnmt3a and Dnmt3b play important roles in adult tissue homeostasis, and their deregulation is causative of disease, including tumourigenesis. Naturally occurring somatic mutations in Dnmts can drive hematologic malignancies and are causative of a diseased state. Interpreting these phenotypes has been hampered by the lack of information regarding the genomic localization of each endogenous protein in adult tissues, and the genome-wide localization and function of endogenous Dnmt3a and Dnmt3b in adult stem cells are unknown. The current study shows that Dnmt3a and Dnmt3b have previously unidentified functions through their association with transcriptional regulatory elements during human epidermal stem cell (EpSC) homeostasis. The current study shows that in human epidermal stem cells, the two proteins bind in a histone H3K36me3-dependent manner to the most active enhancers, a short region of DNA bound by proteins to increase the likelihood of transcription, and are required to produce their associated enhancer RNAs. Results show that both proteins prefer super-enhancers associated to genes that either define the ectodermal lineage or establish the stem cell and differentiated states. Data findings show that Dnmt3a and Dnmt3b differ in their mechanisms of enhancer regulation, Dnmt3a associates with p63 to maintain high levels of DNA hydroxymethylation at the center of enhancers in a Tet2-dependent manner, whereas Dnmt3b promotes DNA methylation along the body of the enhancer. Results show that depletion of either protein deactivates their target enhancers and profoundly affects epidermal stem cell function. The lab conclude that their data reveals novel functions for Dnmt3a and Dnmt3b at enhancers that could contribute to their roles in disease and tumourigenesis. The team surmise that their findings show Dnmt3a and Dnmt3b are altered in many types of tumours, such as those encountered in leukaemia, the lung, and the colon. For the future, the researchers state, as these proteins activate gene expression enhancers through DNA methylation, it would be of interest to study them in cancer cells in order to determine whether they participate in tumour development. Section of the epidermis showing all its layers, with cell borders in green and cell nuclei in blue.